Do you have friends that tell you the game you love is not a sport? Are the naysayers in your life by any chance, runners? You do your best to argue with the runners in your life. You state the facts — walking 18 holes of golf is the equivalent of walking ten miles. You need a strong abdominal core, great eye-hand coordination and flexibility to play golf. The runner in your life just smiles, says golf is boring, and goes for a 10-mile run. Well, now you can tell all the runners in your life about the golf game made for them — Speed Golf. 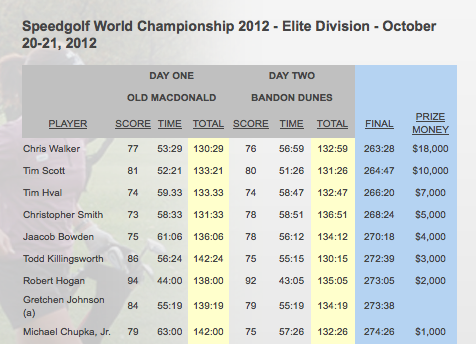 CBS televised the inaugural Speed Golf World Championship from Bandon Dunes. It was fascinating and exhausting to watch. First, a 22-year-old won the competition, which was not a big surprise because of the energy a young person has to draw on in a sport that requires you to run between every shot on the golf course. But what did surprise me is that the man who came in second, Tim Scott (a founder of Speed Golf International) is in his fifties and was diagnosed with eye cancer in 2012. And, even more impressive (to me) was a woman, Gretchen Johnson, came in eighth place. I was not surprised she participated because she is a runner and works at Nike, but what was surprising was that the only woman placed eighth in an elite field of fifteen professional male speed golfers. The scoring is simple — combine the total number of strokes with the total time. The rules of golf have been modified, for example, you can leave the flag in the hole when putting out. They carry a small bag with limited clubs. Also, when a ball is lost, you are allowed to drop it anywhere along the estimated point from where it was lost back on the line of flight to where the shot was originally played. Clearly you need to be skilled in golf and a great runner but it appears from the scores above that being fast is more advantageous than shooting a low score in this alternative golf game format. Will I ever participate in speed golf? No, I have never enjoyed running. Frankly, I love the social aspect of playing a round of golf and don’t see the enjoyment of running the course alone. But I appreciate any alternative format of golf that might bring more players to the sport I love.